New distro items from Convictus Tapes, New Approach Records and Trapdoor Tapes now available. 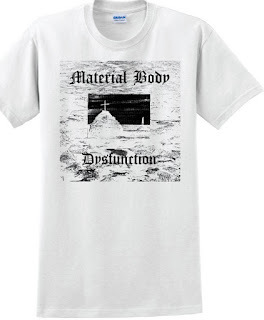 Material Body Dysfunction T shirts are now available for pre-order. This pre-order will run until midnight October 20th. Please allow 3-4 weeks for shipping. Grim - Primary Pulse already sold out. Due to popular demand, shirts are now available in XL. Last day for T shirt pre orders, these go offline at midnight tonight.